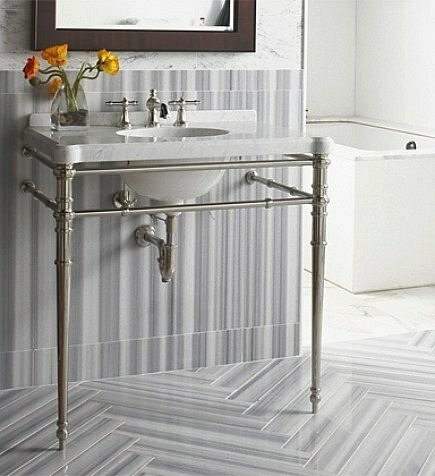 Classic striped marble makes a modern splash in the bathroom. As Shakespeare said, what’s in a name? 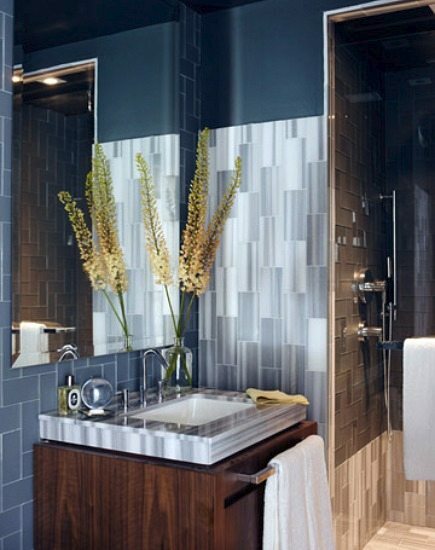 Referred to as Equator Marmara, the striped marble in this Paul Anater bath was laid in a checkerboard pattern on the floor, vertically on the tub surround, and horizontally in the glass enclosed shower. A combination of slabs and tiles were included. 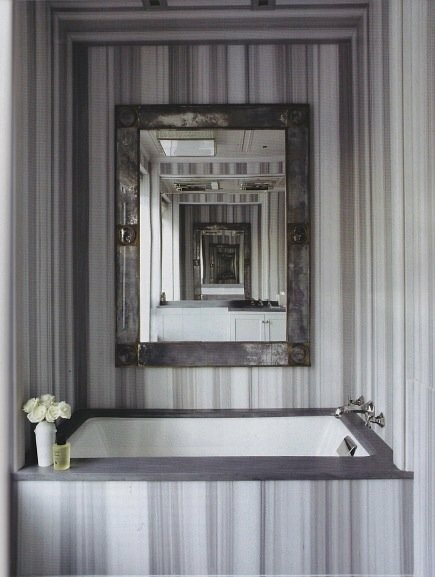 Used as wainscoting and called Asher marble in this Ann Sacks bath, this striped marble has a modernist appeal. Herringbone-style tiles on the floor are a stunner. Also from Ann Sacks is this tub alcove where every square inch is covered. It has too much of a Fun House feeling for me, in a place where I would rather relax. Simply replacing the alcove mirror with artwork might do the trick. Paired with deep blue walls, this installation is a favorite. The vertical accent treatment is repeated on the shower’s lower wall, and the marble is used in slab form on the sink console. The Carre Kitchen was featured in Milan’s EuroCucina 2010. Making countertops and slab backsplash appearances, it’s the perfect touch in what is to me a version of Barbie and Ken’s kitchen. Touches of pink keep it from being too serious, and again, the wall color is a perfect companion to the gray and white striped material. If you love the marble but don’t want the expense of a bath or kitchen remodel, vintage furniture is always an option. This sleek, low coffee table with its simple base seems to float above the floor. 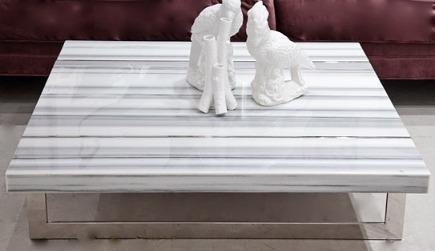 Whether called Equator Marmara or Asher, or it’s lesser known Calacatta Zebrino, this beautiful material is a classic choice. WOW, WOW, WOW! Seriously stunning! I’ve always admired the gorgeous stripey Luce di Luna quartzite that sochi used in her kitchen. 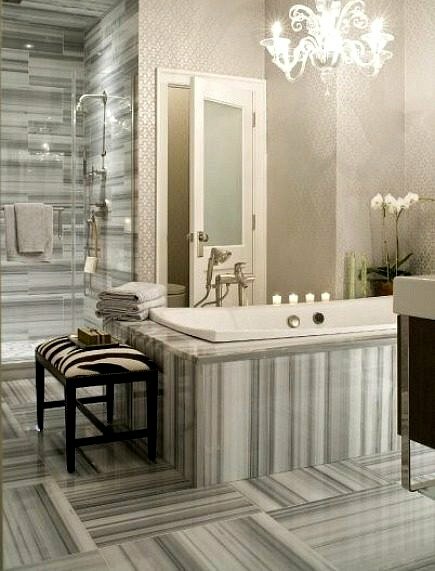 Who knew that gorgeous grey stripeyness could be found in marble tile, too. I think you just set my master bath redo back at least a few more years, so that I can save up for some of that gorgeous tile. Herringbone floors? Love! Thanks for sharing. Whoa. Very interesting. I must admit, though, that I prefer the last photo with a little less of it set off by the solid green and white.